Washington (CNN) - The one African-American running for the GOP presidential nomination said Wednesday the black community was 'brainwashed' for traditionally siding with liberal politicians. "African-Americans have been brainwashed into not being open minded, not even considering a conservative point of view," Godfather's Pizza executive Herman Cain said on CNN's "The Situation Room" in an interview airing Wednesday between 5-7 p.m. ET. "I have received some of that same vitriol simply because I am running for the Republican nomination as a conservative. So it's just brainwashing and people not being open minded, pure and simple." 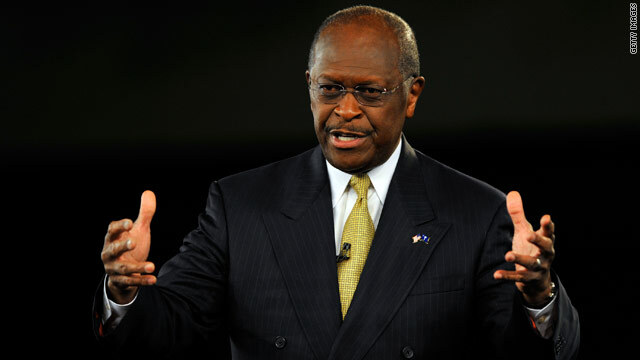 "This whole notion that all African-Americans are not going to vote for Obama is not necessarily true," Cain said. He continued, "I believe a third [of African-Americans] would vote for me, based on my own anecdotal feedback. Not vote for me because I'm black but because of my policies." "It's not insulting as much as it is a disservice to the American people," Cain said. "Chris Christie has been saying for a long time he's not interested in running. The media is trying to create a story by sucking Chris Christie into race, just like they made a story by sucking Rick Perry into the race." I'm an independent black man and I think Cain's statements are valid to a point but he doesn't go into the reason. It's not because of wanting handouts like so many of the people here are stereotyping. It's politics. The person sitting as POTUS usually get credit for whatever happens on his watch (along with the party that he belongs to). It just so happened that a Democrat President was in office and signed the civil rights act and voting rights act. Republicans in Congress, at the time, had a higher percentage voting for the passage of these legislations than the Democrats. At this time the south was primarily Democrats. After the passage of these acts, a large number of Democrats left the Democratic party to form the Dixiecrats and eventually went to the Republican party in protest to their party voting for Civil rights and the voting act. The long and short of it is this. The republican party of the 60s and before are not the same as the one of today. Look at the people that use to be Democrats before the civil right act and voting rights acts were signed: Strom Thurmond, Jesse Helms, Trent Lott, and many more. What I'm saying is that you can't talk about the parties of today in comparison of the parties prior to the passage of the civil rights bill and voting rights act. The parties are different now. Cain could be looking at the Republican party as being the same party when he was a little boy (not racist boy, just to be clear). Have you considered the similarities of the Dem Party 'help' for the AA communities resembles the same amenities of the plantation? "Stay in line and I'll feed you, house you." Step out of line and you are an oreo. Reminder: LBJ was a Dem and no friend to blacks. So where did all this hate of republicans come from? I know: the plantation owners-The Dems. Rofl. He is exactly correct. You people that say that black people vote for democrats because they serve them... really? Show me statistics that show black wealth has increased dramatically? Where is the proof? I am pretty sure that there is still an abundance of black poverty. What you mean to say is the republicans are not fans of handing out checks for free. Of course the democrats brainwash the colored community. If they didn't carry their vote the democrats would never win. What advantage is it for democrats to increase the black wealth? They would just become conservative! God. Country is littered with lazy and worthless morons. I don't care for Cain but he was spot on. since when refusing civil rights to African Americans is brain washing them into voting democrats? to me it sounds more like, the GOP didn't want African Americans votes, so it told them you can't vote. No\w they can vote, not with the help of the GOP for sure, but with the help of the democrats. And the only thing Cain can say is blacks are stupid enough not to know the difference between justice and brainwashing? Here is one idea: African Americans, why don't you show Mr. Cain that his pizzas does taste a bit like KKK and therefore is time to not eat it anymore? Hell I live in Memphis. They are biologically programmed to vote Dumocrate here. According to Albert Einstein, the definition of insanity is doing the same thing over and over again and expecting a different result each time. It has been 150 years since the end of slavery. If the only thing Liberal-Democrats can offer to African-Americans is to "continue the struggle", then one might give consideration to trying something else. This is a misquote and says the opposite of what he said. Delete the word "not" in its first instance. Typical CNN. Thanks for stating the obvious. Let's hear the brainwashed complain that they are not brainwashed. There is a special place in "liberal hell" for females, blacks, and other minorities who dare speak out against the Party. As evidence, see Cain, Thomas, and Palin. You libs are all for a "diversity" where everyone holds the same beliefs. take a look around all you smart black people. we suffer the most and nothing is obama's fault. yeah i'd say that's brainwashed. just look at all your comments, republicans hate you because they realize the country can no longer afford all the handouts, which of course affects all races, but that wouldn't speak to your point. the history of black people i embrace is that of strong family value's (today we can't get these young clowns to marry the mother of their children) people that didn't want handouts, but a fair chance to get their own. from the bottom up just like CAIN did. the truth is all you people that claim to be supporting a black man is really supporting liberalism, something our people were not and CAIN proves that without saying it. he may not be the answer(although i truly believe he can be), but obama has proven to be everything conservatives warned he would be, and unfortunately, the country is paying for it. especially black people! and yes i'm an american that is black, that once felt like most of you, i thank GOD for opening my eyes. because i would rather have a republican tell me " if you want it, work for it " rather than a democrat promising me everything i need and then ending up in a housing project. now that's the closest thing to modern slavery i can think of, thanks to them DEMS. sad shame is this probably won't change. the blacks voted strictly on a race basis, but always want to blame others for being racist. those blacks deserve obama, now take off your house slippers and get in line to vote for some more of this suffering like i know you will ! ! ! That's the silliest comment I've ever heard. EVERYBODY knows black people don't have brains. Several people have commented that the Republicans have not tried to engage the African American community. To you all I say, why don't you engage the Republican Party with constructive questions about how you can be helped by its platform. Help yourself to a conversation with a Republican. Stop waiting to be engaged. Just because the Dems "engage" us does mean they care about us. There's no correlation there people. Be proactive. It's your future. There's a high chance the Republicans could win given all that is going wrong for the country. So I think it's in our interest as Black people to be prepared, for this likely reality, by pressing on to understand what, if any, gains we could see if/when a Republican is president. It's going to happen - in 2012 or thereafter. @ Edwin " Fact is, the GOP has done nothing for the black people of our nation, and the civil rights era was not that long ago and which side did the GOP take then? We all know that answer...as disgusting as it is.".... Wow!! My guess is that you in fact do NOT know which side the GOP took then. And apparently you don't know which side the Dems took either... Man, you really need to check your history before you try to make a point with a nonsensical argument. It's really not that hard to educate yourself. You obviously have access to the internet. You should use it to get your facts straight before making a fool of yourself. Cain's insane. His skill set would be perfect if America was a failing pizza parlor. Since it isn't, and he knows NOTHING about international affairs, he's not a convincing candidate. Seriously, is he going to fix the economy by using less cheese and buying cheaper flour, and letting a few cooks go? is that a double negative? hmm, i think what Cain is trying to say is that all AA ARE going to vote for Obama and unless they're making over 250k/yr they sure as heck better. Cain=another brainwashed moneybags corporate pig stuffed into a suit who'll do anything he can to stuff his buddies pockets with cash. Corporate America, get while the gettin's good! Democrats are the party of the lower class–why would anyone want to openly identify as being a part of that? Voting GOP is a status symbol, like carrying a gorgeous LV handbag. Democrats GIVE too much and republicans well, they don't GIVE a damn. Your comment has to be the most ignorant comment on the board. I bet you have several "LV" bags, a rented property and a $9.00 hr. job with NO savings in the bank. You are pathetic.